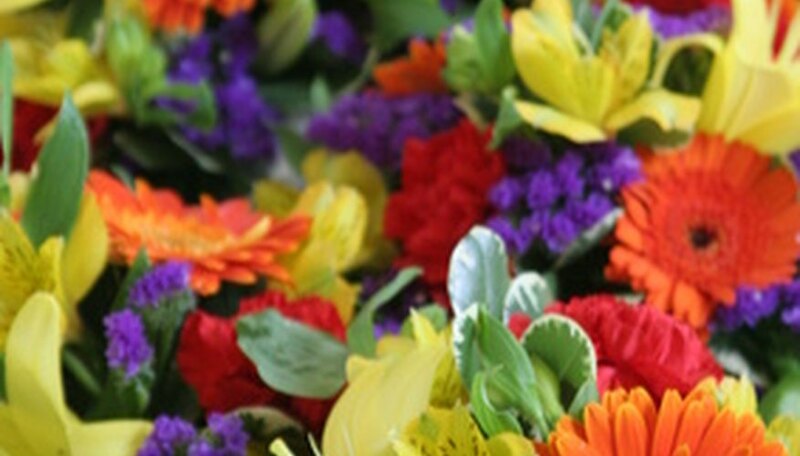 Proper care of flowers immediately after they’ve been cut can extend their lives significantly. After cutting and preparing their stems, place them in a vase filled with water and preservatives. These preservatives will nourish the flowers and inhibit bacterial growth. Preservative powders are often provided with purchased flowers, but you can easily make your own mixture at home with a little bit of sugar, vinegar and bleach. Place the flowers in a container of warm water immediately after cutting or as soon as possible after bringing the flowers home. Wrap the flowers in the container in a piece of paper or plastic to prevent water loss while they soak in the warm water. Allow the wrapped flowers to soak until they become crisp (approximately two hours). Purchased flowers should soak for at least 20 minutes before arranging. Mix together 2 tbsp. white vinegar and 2 tbsp. sugar with 1 qt. warm water. Add ½ tsp. chlorine bleach. Use this solution to fill a clean vase for the arrangement. Cut the end of each flower stem at a diagonal with clean, sharp scissors or pruning shears. Cut to the required length for the arrangement. Remove all leaves from the portion of the stem that will be underwater in the vase. Arrange the flowers in the vase, returning them to the water as quickly as possible. Keep the flower arrangement away from direct sun and heat sources, and place them in the refrigerator overnight and when not in use. Cold storage will prolong their life. Change the water in the vase every two days. Clean the vase and mix a new solution of sugar, vinegar bleach and water. Return the flowers to the preservative water as quickly as possible.